Bertie McQuerty is the other brother, the one who struggles just a bit. He has no special arty skills, or sporty skills, in fact he feels quite lacking in skills and talents altogether. Not to be put off though, Berty does attempt things but somehow, no matter how hard he tries, he ends up being a little distracted. The gorgeous illustrations show just how adorable he is with his big friendly smile. He does have a little yellow chick as his special friend and young readers will love looking for this chick hidden on each page of the book. 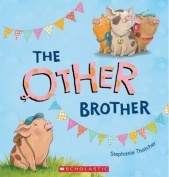 This is a feel-good picture book all about trying things out, giving it a go and accepting that we are not all the same. We all have that something which makes us special, that something we are good at. Do look out for this gorgeous picture book especially if you want to know what makes Berty McQuerty special. I think this would be ideal in both pre-school and primary schools, not just for its moral message but because it is simply a lovely book to share.